The 2015 Mopar Dodge Charger R/T Funny Car will make its official NHRA on-track debut at the 2015 season-opening Winternationals event Feb. 5-9 at Auto Club Raceway in Pomona, California. Pre-release testing was done at Norwalk and Indy. Tuesday afternoon at SEMA—at 4:26 to be exact, show goers got a peek at the new 2015 Mopar Charger R/T Funny Car. 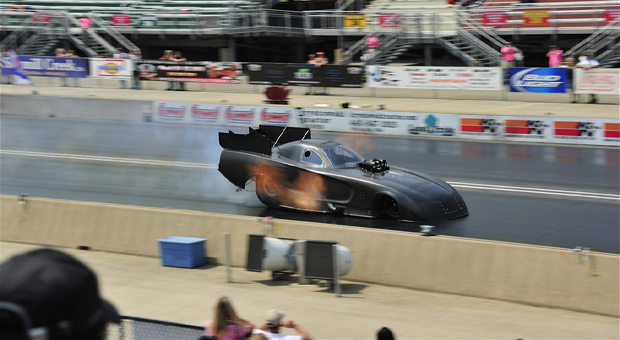 The new Funny Car is slated to make its official on-track debut at the 2015 season-opening Winternationals in Pomona, California. Behind the wheel will be Don Schumacher Racing’s driver, Matt Hagan. 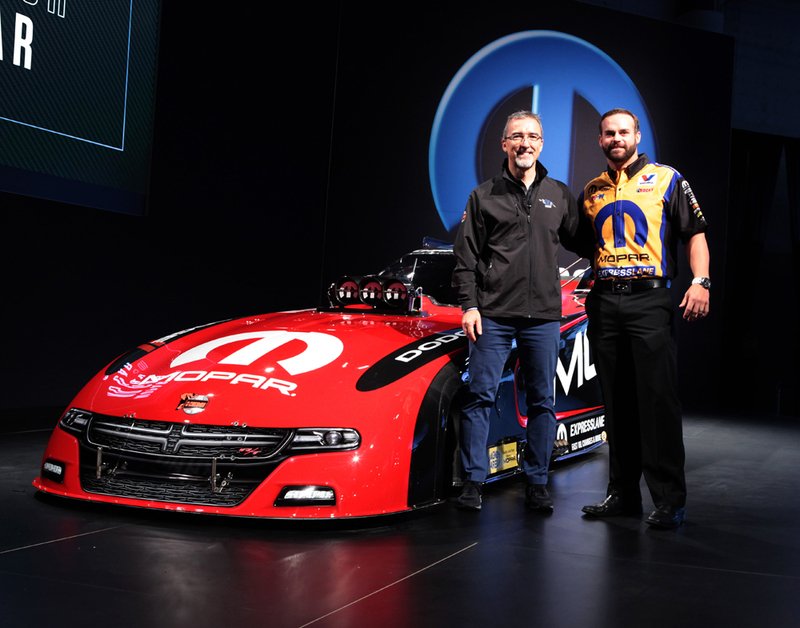 Fiat Chrysler Automobiles’ (FCA) Mopar and Dodge brands along with Matt Hagan, reveal a new 2015 Mopar Dodge Charger R/T Funny Car drag racing vehicle at the Specialty Equipment Market Association (SEMA) show in Las Vegas. “We’re very excited with the results of our efforts and look forward to seeing the new-look DSR cars make their debut in the 2015 season opening race,” said David Bailey, Senior Manager – SRT Motorsports Engineering and Design. “A lot of planning and work went into designing and building the 2015 Dodge Charger R/T NHRA Funny Car. From the first steps of creating Computer Aided Design (CAD) models into a package model by the FCA Engineers, to working with designers from the Product Design Office (PDO) to include proportions and style cues taken from the production version of the 2015 Dodge Charger, it all came together nicely. 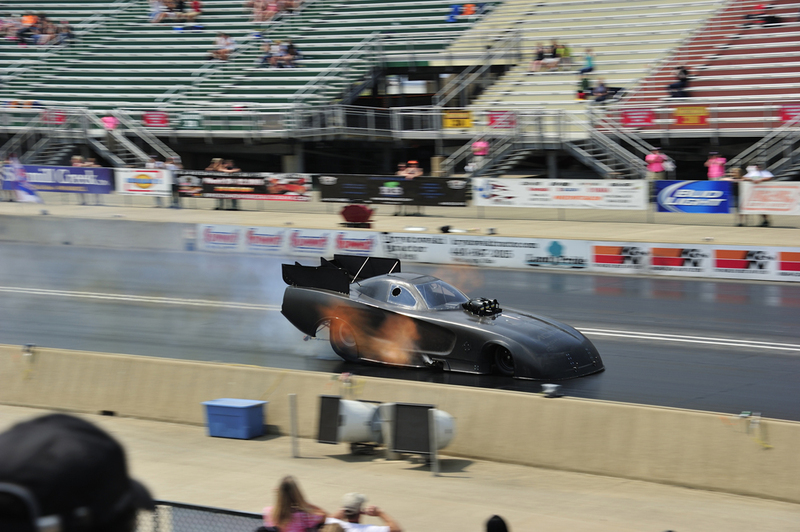 “Through all these design reviews, engineering changes were made to the theme with the primary goal of improving the durability, strength and aerodynamic performance of the new vehicle while maintaining all NHRA dimensional requirements. I think we can all be happy with the results,” added Bailey. 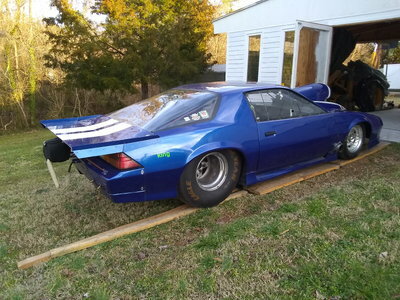 Not only was the development of the new Funny Car body a result of in-house engineering, but the project tapped into outside resources as well. FCA worked in conjunction with the University of North Carolina on an extensive study to improve the strength and durability of the body composition. 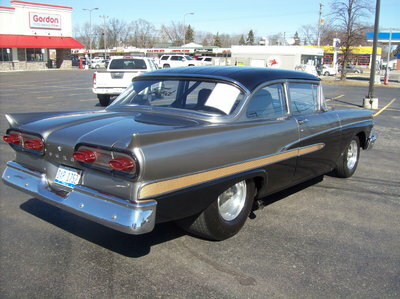 The engineering team was challenged to carryover the aerodynamic properties of the previous version Charger design, while making the new body more lightweight. Sight-line studies contributed to the new design by incorporating geometry changes that moved the windshield and greenhouse (cockpit area) back, in order to provide improvements to driver visibility, which is critical at the 300 mph. Another major benefit of the redesign includes minimizing of the effects of destructive forces on the car by providing proper clearance for the injectors, blower, and engine, all while maintaining the series’ sanctioning body’s extensive list of guidelines and standards. With collaboration from DSR racing, the 2015 Charger Funny Car gives the driver increased visibility, the car more downforce, and reduced wind resistance. These are key elements of this new Charger body that will enhance performance of our team in both elapsed time and speed. The new 2015 Charger Funny Car design was developed with the team of engineers who worked on the 2014 Dart Pro Stock vehicle that was introduced earlier this year. The 2015 car was then validated with aerodynamic wind tunnel testing at the company’s facility in Auburn Hills, Michigan. Matt Hagan let us know, “The new Mopar Funny Car designers, engineers and our fabrication shop at DSR did a phenomenal job on this piece. The car — how mean it looks, the way it handles, the way it runs on the race track— is simply amazing. It’s also so much brighter [inside], with the biggest improvement for me being visibility. When I sat in it, my lights [reaction time] improved. I really think it’s going to improve the driving ability of anyone fortunate enough to get behind the wheel of it. 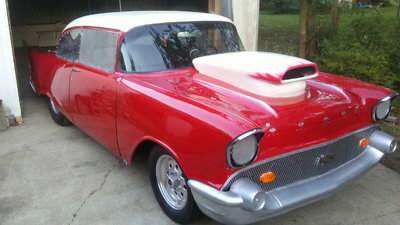 Making Friday night qualifying runs with the new body is going to be so much fun”. The current Dodge Charger R/T Funny Car was introduced in 2006, and to date has won two consecutive NHRA Funny Car World Championships, one with Matt Hagan in 2011 and one with Jack Beckman in 2012. The Charger Funny car has also earned 68 NHRA Funny Car national titles, 77 Runner-up finishes, 44 No.1-qualifier positions, and is responsible for 12 of the 33 three-second runs in Funny Car history, including the very first one (3.995 seconds) posted by Hagan at zMax Dragway in Charlotte, North Carolina, in September 2011. The new design was developed with the team of engineers who also worked on the 2014 Dart Pro Stock vehicle that was introduced earlier this year. The 2015 Charger was then validated with aerodynamic wind tunnel testing at the company’s facility in Auburn Hills, Michigan.